The New Mexico State baseball team heads to Edinburg, Texas for the opening of WAC play against Texas-Pan American, March 21-23. The Aggies are 8-12 on the season. 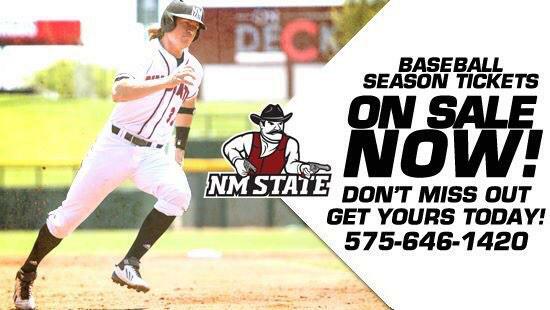 All three games of the series will be broadcast on KSNM 570 AM with Jeff Matthews bringing the call back to Las Cruces. The Aggies are 13-5 against the Broncs all-time, sweeping a four-game series with Texas Pan American in 2012. The New Mexico State equestrian team wraps up its regular season this coming weekend against West Texas A&M on March 22 in Las Cruces at the NM State Equestrian Complex. The Aggies are 3-1 on the season at home. Saturday’s competition will also be senior day for six seniors on the Aggie roster. The No. 47 ranked New Mexico State men’s golf team travels to Phoenix, Ariz., for the Thunderbird Invitational, March 21-23. The Aggies are coming off a 12th place finish at the NIT this past weekend. The Thunderbird Invitational will be the third tournament for NM State in the last two weeks. It’s rivalry week for the New Mexico State women’s tennis team as the Aggies face New Mexico and Texas-El Paso this weekend. NM State will meet up against I-25 rival UNM on Friday, March 21, beginning at 2 p.m. (MDT) at the NM State Tennis Center before making the short trip south to face UTEP in El Paso, Texas, on Sunday, March 23, beginning at 10 a.m. The New Mexico State softball team will be back at the NM State Softball Complex for the first time since Feb. 16, as I-25 rival New Mexico Comes to Las Cruces for a single game on Wednesday, March 19, beginning at 5:30 p.m. The Aggies are coming off a 21 straight road games. NM State went 12-9 during that stretch. The New Mexico State track & field team travels to El Paso, Texas this weekend for the UTEP SpringTime Invitational, Saturday, March 22. This is the Aggies first outdoor meet of the 2014 season and will also be the one of two times this spring that NM State will compete in a meet on the UTEP campus. The 2014 Western Athletic Conference Tournament Champion New Mexico State men’s basketball team takes on No. 5 San Diego State in Spokane, Wash, Thursday, March 20. The Aggies, who enter the tournament as a No. 13 seed, finished with a 26-9 overall record and an automatic bid for winning the conference tournament. This is the third straight NCAA Tournament appearance, while making the ‘Big Dance’ for the 21st time in program history. Head Coach Marvin Menzies has been a part of four tournament appearances.